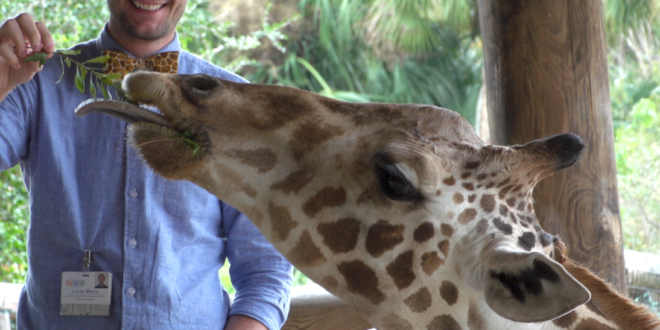 Faraja enjoys some tasty wax myrtle leaves from JU biology alumnus Lucas Meers of the Jacksonville Zoo in the video "Giraffes... Four Species or One?" 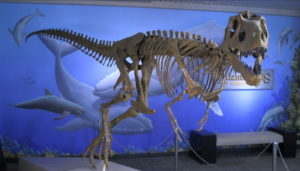 The educational video is part of JU's "Science of..." series. What kinds of secrets are giraffes hiding in their DNA? What do they eat at the Jacksonville Zoo and Gardens? And just who is Duke the Giraffe, anyway? The most recent giraffe videos from the latest installment of “The Science Of…” educational series produced by Jacksonville University answer those questions and more – with a special appearance by the worldwide head of the Giraffe Conservation Foundation. They also engage viewers with some quirky local giraffes up close and personal. In addition to Duke, local father of 16 giraffes, viewers can meet Faraja as she enjoys munching on wax myrtle leaves, as well as other members of the herd, such as Spock and youngsters Forrest and Fiji, Duke’s two most recent offspring. “The Science Of…” is a new online science and nature video magazine produced by JU in collaboration with the Jacksonville Zoo and Gardens. “The Science Of…,” which launched last fall, has produced videos on sea turtle conservation (at the Beaches), dinosaurs (at the Museum of Science and History), the St. Johns River (at JU’s Marine Science Research Institute), and now, giraffe conservation (at the Jacksonville Zoo and Gardens). St. Joseph Academy students watch “Giraffes… Four Species or One?” The educational video is part of JU’s “Science of…” series. Ouellette’s hope is to build a resource of interesting videos that will be viewed by a wide range of people, and used by teachers to connect learning with local nature, local activities, local research and local people in an engaging way. The debate on whether Nanotyrannus is a new species or a juvenile T. Rex is explained in the video “Nanotyrannus… A Controversial Dinosaur,” a JU “Science of…” video filmed at the Museum of Science and History in downtown Jacksonville. Likewise, at the St. Johns Riverkeeper website, you can find “The Science Of…” videos on microplastics and algal blooms, which are used to highlight these problems and local efforts to understand and bring awareness to these issues. Students in JU alumnus Chris Williams’ AP Biology and Environmental Science classes at St. Joseph Academy Catholic High School in St. Augustine have watched a number of the videos and give them high marks for being interesting and entertaining. Student Nayeli Jimenez liked the downloadable companion guides accompanying the giraffe videos and recommended having a “Science Of …” video as an assignment every week to learn about different species. 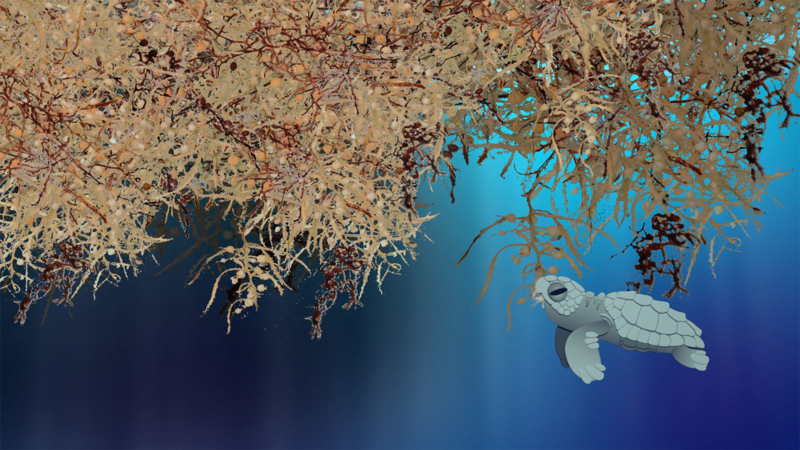 Pip the baby sea turtle is part of the animation in the video “Sea Turtles … Threats and Solutions” in the JU “Science of…” educational video series. Williams said the videos have the possibility of connecting his students to the bigger picture of the planet’s fragile condition. The origins of the video series date back to an appearance Ouellette made on the local television talk show The Chat to talk about germs. He got to thinking about non-scientists in Jacksonville and wanted to do something to help bring some science to the community in an easily digestible, interesting format. For example, on just one four-mile stretch of Ponte Vedra Beach, more than 7,700 baby sea turtles hatched in one season. “Amazing, and when you tally up all of the baby sea turtles each year from the sandy beaches across Northeast Florida, you start to realize how important our beaches are for loggerhead turtles. Truly astounding,” Ouellette said. While the focus is local, the reach is global. The videos have begun gaining traction, with more than 3,000 views over the first six months, from more than 40 countries. Closer to home, Jill Sullivan, Coastal Sciences Department Chair at Mayport Coastal Sciences Middle School, has shown “The Science of the St. Johns River: Plankton Sampling” videos to her students, which feature Dr. Melinda Simmons, JU Assistant Professor of Marine Science. “The videos were shown in my aquaculture classes. The students were in awe to actually know a ‘real’ scientist,” Sullivan said. Dr. Simmons has worked directly with Sullivan’s students in their visits to the JU Marine Science Research Institute, and the videos were useful in providing students a connection between their research methods on plankton and Dr. Simmons’, which was on a much larger scale. “The Science Of…” is a collaboration that includes JU faculty from science, art and music, with original music by faculty member Tony Steve, animations by Professors Eric Kunzendorf and David Smith, and videography and editing by Ouellette and JU Media Services Manager Greg Minton. Jacksonville Zoo and Gardens Conservation Program Officer Lucas Meers, a 2012 JU alumnus, is the lead for the conservation series, and Dr. Lee Ann Clements, Associate Provost, will be the lead for an art series, with science of glassblowing videos to come out later this year. Funding has come from JU’s Florida EPIC (Entrepreneurism, Policy, Innovation and Commerce) Program. Jody Palmer, Director of Conservation at the Brevard Zoo in Melbourne, Fla., which has a sea turtle hospital, said she’s excited by what she’s seeing in the four-part sea turtle video series. In that same video, another student at St. Joseph Academy, Cassandra Johnson, learned about how important it is to use turtle safe lights at the beaches. “I actually really enjoyed how they explained how we were able to help the problem of dying turtles and think they should make it more public to use the ultra-red lights to not distract baby sea turtles,” she wrote in her evaluation. As for the videos on giraffes, 2016 may prove to be a pivotal year for the animals. At the close of the year, the International Union for Conservation of Nature listed giraffes as vulnerable to extinction because of rapid losses of wild populations. This comes hot on the heels of DNA research that proposes that African giraffe populations are so different from each other that there are actually four distinct species of giraffe instead of just one, which is how scientists currently classify them. On top of that, the first genome sequence of a giraffe was published earlier in the year. When Ouellette learned about how DNA analysis concluded that there are four species of giraffes, and what it means for giraffe conservation, he decided that people in Jacksonville needed to know. “Last September when I read the new DNA research that shows that giraffes are genetically different to the point that there might actually be four distinct species, I immediately contacted Lucas to see about tying in the giraffe herd at the Jacksonville Zoo and Gardens,” he said. “4 species or 1?” explains some basics about giraffes and where they live, highlights how species classification, including new DNA research, has important conservation implications, and what you can do to help save giraffes. “What do they eat?” gives a behind-the-scenes peek at preparing mixed herbs and alfalfa for the herd, and also highlights some of the plants the giraffes browse and graze on as they roam about their “African” Savanna right here in Jacksonville. You can even watch Duke eat one of his favorite treats – an unpeeled banana. “Duke and his Family Tree” highlights the Zoo’s giraffe family, including Duke and two of his 16 offspring. In addition to the videos being housed at The Science Of… website, which also has companion guides and transcripts for the videos, they are also available through The Science Of… YouTube channel and the Zoo’s website, and are being broadcast on monitors throughout the Zoo. Steve, JU faculty member and Artist-In-Residence of Contemporary & World Music, channeled an African theme as he created and performed the music for the giraffe videos in his home studio, while Anthony Akapnitis, a music major graduating this spring, recorded it. During the credits of “Duke and his Family Tree,” viewers even get a glimpse of Steve playing the udu, an instrument that originated in Nigeria, a country where Northern giraffes have sadly gone extinct. All of the conservation videos will have downloadable companion guides, which can be used to delve deeper into the topics and help teachers design lesson plans. All videos have downloadable transcripts and are closed-captioned in English and Spanish. An abbreviated version of this article appeared in The Florida Times-Union on March 20, 2017. For more on “The Science Of …,” visit http://thescienceof.ju.edu.